First Impressions. Short measurements before our full review on the Google smartphone. Although there is now hardly a shortage of good Android phones, the Nexus line has always been about pushing manufacturers to do better by providing them with both competition and a template to follow. The Nexus 5X succeeds handily on both counts. Barring a few minor flaws, it’s a quality smartphone in its own right that also challenges makes of both mid-range and premium smartphones to do better. Overall the Nexus 5X is a bit of a mixed bag. With its plastic back and light weight it does look and feel rather cheap, particularly the power and volume buttons, but it’s actually quite robust and the smooth plastic back resists fingerprints well. It also has some good features, the screen for example is impressive and the well placed fingerprint reader makes for ease of use. It goes without saying that, if the way your phone looks matters to you, the Google Nexus 5X is not the smartphone for you. It’s awkward and ugly to look at, especially in the powder blue pictured here, and feels rather cheap. If you don’t give a hoot about that, however – and, hey, you can always pop it in a case – the Nexus 5X is hugely appealing. The camera is simply stonking, the performance is fast and it doesn’t overheat. The software is also clean and simple, and Google and LG have squeezed in most of the components a modern smartphone needs, the one exception being the missing storage expansion. So there you have it for this second opinion look at the Nexus 5X! I really wanted to love this phone, and in a lot of ways I really do. However, there were a few issues, mainly to do with performance, that proved to be a let down. On way more than a few occasions, I did have an issue with getting everything I wanted to done on this device, with the little bit of lag creating issues with typing, or resulting in slow loading times. These problems may not be as much of a big deal for a lot of users out there, and the Nexus 5X is definitely a good choice in the affordable segment, but the flagship experience you may be looking for might not be available with this device. The most compelling Android devices released each year often fall under Google’s own Nexus brand. Every Nexus phone is launched running the latest version of Android without custom skins and other blemishes, and the hardware you get is typically just as good as other high-end competitors, albeit at a lower price point. The Nexus 5X is Google’s new mid-range contender, designed alongside the Nexus 6P to be the company’s poster boy for Android 6.0 ‘Marshmallow’. The handset is manufactured by LG, who has returned to the realm of Nexus devices after developing the much-loved Nexus 5 in 2013. Because Google didn’t release a five-inch-class smartphone last year, the 5X is the true successor to the Nexus 5, with many owners of the two-year-old handset eyeing off an upgrade around this time of year. In order to keep up with the current manufacturer trend and stay at par with its arch rivals, Google has churned out two Nexus models built by different OEMs – Huawei-built Nexus 6P and LG-built Nexus 5X. The 6P is the crème de la crème and gets all the finesse and fancy features, while the Nexus 5X is a toned down device targetted at the budget audience. 80% Nexus 5X review: Google's Nexus back at its best? 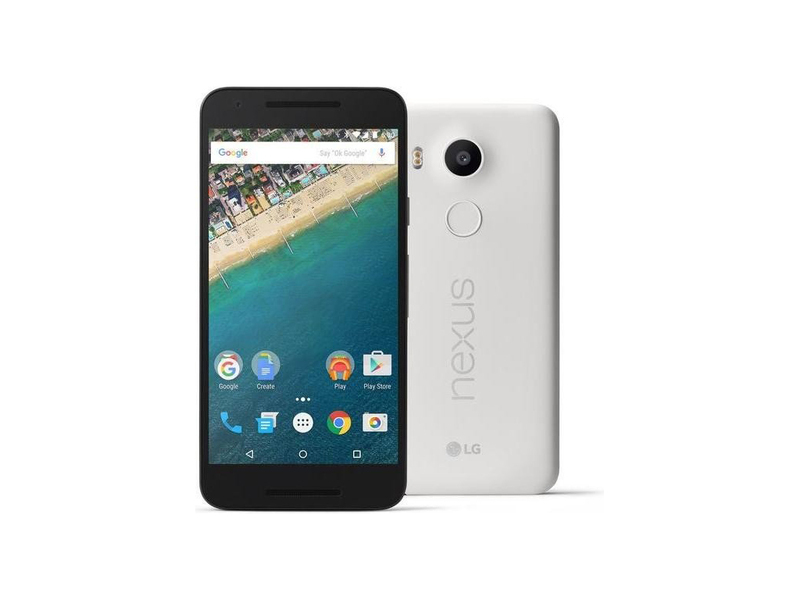 Google’s Nexus 5X is the best one-handed Android phone on a budget, given its adequate specs. It nearly matches the LG G4 on the inside with a processor that’s fast enough for most people and a camera that’s just as good in low light conditions. On the outside, the plastic design is never going to win awards or feel premium, and that 2GB of RAM does show a slowdown by the time you’re ready to turn this phone in. Its future-proof in other areas, though, with a fingerprint sensor, the USB-C connection and the lightweight and thin design if you can’t handle the larger Nexus 6P or its higher price. At $379 unlocked for the 16GB model and $429 for the 32GB model, the Nexus 5X is the best-priced smartphone you can buy. It’s sleek without being pompous, comfortable without compromise, and powerful for your everyday needs. Combine all that with the option to use Google’s Project Fi service and you have a killer combination of a snappy yet inexpensive phone with an amazing cellular service plan that’s equally low priced. Even if you don’t have access to Project Fi, there is no better phone to buy unlocked. Just knowing that the software bugs in the Nexus 5X will get fixed quickly by Google directly, instead of waiting months or longer for other phone makers, is reason enough. It’s a great deal no matter how you look at it. A new Nexus phone used to be something to get excited about for Android devotees; it represented what Google thought could be an ideal mobile experience for others to build off of. The Nexus 5X doesn't quite engender that same mystique, but after spending over a week with one, we can still recommend it as one of the best overall value smartphones around. It has all the phone’s good bits, like great performance and smart pricing. But it also keeps a few bad bits too, like a pretty naff mobility, unambitious speaker and slightly pedestrian-feeling build. The Nexus 5X certainly isn't a perfect device. It's not meant to be a flagship phone and it's not priced like one; at $379 it's not the most expensive phone out there, but it's not exactly the cheapest one either. Still, I find myself really liking it despite its flaws. I definitely have a soft spot in my heart for the original Nexus 5, and I was quite disappointed when it didn't receive a true successor last year. In short, unless you’re the shallow type with more money to throw around than I have, I’d advise you consider the Nexus 5X as a serious option for your next smartphone. It’s no beauty, but the reasonable cost and all-round competence is a massive plus. While the Nexus 5X isn't the headline-grabber that Google and LG perhaps hoped for, for a handset which costs just £339, it's still an impressive achievement and a recommended purchase for Android purists. The "pure" version of Google's OS included on Nexus phones is undoubtedly the big selling point here, and it's worth sacrificing some other features to get it. If you’re a huge fan of the Nexus 5 and want the next best thing but, you know, newer, Google’s and LG’s Nexus 5X is definitely worth a look, but if you want a Google phone, we’d probably look a little higher, because only at only a little over a hundred more for the Nexus 6P, you’ll likely find better value across the board. The Nexus 5X is a great phone, but priced at Rs. 31,900 for 16GB or Rs. 35,900 for 32GB, it might seem a bit too expensive. The reality of the Android market today is that a lot of very capable models with similar features and specifications cost much less. Even if you're comfortable at this price level there are other options, such as the Samsung Galaxy S6 (Review | Pictures) which is a superb buy at its current price of Rs. 36,000 - and that's for a 32GB model with an all-metal body, QHD screen, and flagship-class camera. Just a lacklustre reference design? There’s absolutely no point in me beating Google (and LG) up over the Nexus 5X, its design and component choices, since I don’t matter to them. Neither do you. The 5X is for developers to play with and to check that everything they’re planning for Android 6.0 works as advertised. That a few million geeks around the world were also counting on the 5X to be their next ‘hero’ Android smartphone is… unfortunate. It’s not, of course. The ‘hero’ device, I mean. Will the Nexus 6P fit the bill any better? Watch this space! After all that we get the feeling the earlier Nexus 5, from 2013, looks and feels much better than the current Nexus 5X. Sure, the rear-mounted fingerprint scanner and 1080p display make the 5X worth upgrading to, but it hasn't quite got the X factor in all areas. There's no support expandable storage, no wireless charging, battery life isn't great, and the construction is plasticky (we don't actually mind, but some will). At this sub-flagship level there's increasing competition too. Now, all of that being said, if you simply prefer a smaller phone, I certainly wouldn't steer you away from the 5X. As far as more compact devices go, it's hands-down the best all-around user experience you can get with Android right now -- with the same superb software, ongoing speedy updates, and outstanding camera the 6P provides. And it really is comfy to carry and use in a way that plus-sized phones just can't match. The 16GB model sells for £339 and the 32GB sells for £379 direct from Google, which based on the performance available is a little pricey, pushing its appeal more specifically towards Android purists than the general masses. For those who want a great all-round flagship, there are a number of devices from earlier in the year that continue to drop in price, which might serve as ideal alternatives if the Nexus 5X doesn't tick every box, but eitherwise, we're pleased. The Nexus 5X is a delightful device. It does not overawe you with highly saturated images, power-packed specifications, or any of that. This year, the Nexus is all about taming the power, and using available resources in full glory. Priced at Rs. 31,900, the Nexus 5X beats all other similarly-priced devices like the OnePlus 2, Samsung Galaxy A8, Honor 7 and HTC One E9+, not only in terms of brilliance in performance, but also in streamlining the entire device. The Nexus 5X, truly, is Android in all of its glory. Google's Nexus brand has been a lot of different things over the years. With the Nexus 5X and 6P, it's fully living up to the idea of representing true universal flagships for the Android platform. Both devices serve as demonstrations of just how good Android can be -- not only for power users but also for ordinary folks just looking for an outstanding all-around experience. The Nexus 5X isn’t the best phone; it’s not even the best Nexus. It’s not meant to convert buyers of $600 Samsung and LG premium phones to the Nexus program. It’s meant to please the Android fans who have been buying Nexus phones for years, and it will. If this had been released a few months ago I’d be lauding the Nexus 5X as one of the best value for money smartphones on the market. However, with the OnePlus 2 and Moto X Style out, its specs are unremarkable, if a little below average, at its price-point. For long-time Android phones, the Nexus 5X is what it’s all about. It’s like an affordable pickup truck. It won’t turn heads, and doesn’t have every feature on the market. It’s not the fastest thing on the road. But when your friend needs to run to Ikea, who do they call? The guy with the pickup truck. The Nexus 5X is very much like its 2013 predecessor in that it delivers a lot of capability for a very competitive price point, and it manages to do so while still looking fairly sharp. But the 5X is no show horse. It’s the phone you toss around without worrying about scratching it up; the one you buy because it’s a good deal, not because it’s delivering a premium experience. So there you have it for this in-depth look at the Nexus 5X! The $379 price tag returns the Nexus line to what was the biggest selling point of the series, quality with affordability, but there are now some great devices that offer the same, such as the OnePlus 2, the Moto X Play, or even the Moto X Style (Pure Edition). The Nexus 5X may not be the best bang for your buck smartphone of all time, but it is definitely a fantastic device with a lot to offer. If you are someone who has been waiting 2 long years to upgrade from the Nexus 5, the much-improved camera and the latest iteration of Android make the Nexus 5X completely worth the upgrade. We have to tip our hats to Google for bringing the best high-end Nexus they have ever put together, yet they also made a lot of Nexus 5 fans happy with the 5X. Those grabbing the mid-end device will have an amazing experience, but if what you want is to be on the cutting edge, the Nexus 6P is the obvious option. The Nexus 6P is incredible, the Nexus 5X is essential. Assess your needs, take your pick, and you can enjoy the best that Google has to offer in this year’s two great Nexus offerings. No, The Nexus 5X isn't the best phone you can get, or even the best Nexus anymore due to the Nexus 6P being the bigger and faster of the two. It's more like the the perfect fit for one hand and the closest thing to a five-finger discount given the specs. The Nexus 5X is a serious comeback for the Nexus brand after last year’s model that no one wanted - sorry Nexus 6. It’s a mid-range handset that will suit a lot of people, and although it’s not the ridiculous bargain its predecessor was, it’s a very good phone indeed. With its raw-looking images, neutral colour cast onscreen, clean-sounding speakers and vanilla Android OS, you could say the Nexus 5X tells it like it is, and I rather like that. If you want the best ‘droid on the market, get the 6P. Even though the 5X is my personal favorite, the 6P is the more powerful phone, and the one better equipped to serve your every need throughout a long and busy day. But if the 6P is too big or too costly, the 5X is your top choice for a Marshmallow device. You’ll have more room in your pockets, too. Overall, the Nexus 5X offers a great combination of hardware and software, making it one of the few one-handed unlocked smartphones that won't break the bank. There are no other close competitors in this size range, so you need to be willing to size up or down. And if you're willing to stretch your palm (and your budget) a bit further, the Nexus 6P is our Editors' Choice for its higher-quality build, faster processor, and better-sounding speaker. I know that, for some, the lure of pure Android is so great that they won't consider anything other than a Nexus device. Ironically, though, one of the very reasons Google began the Nexus program was to coax manufacturers into following its lead on things like update speed and hardware specifications; HTC has done just that, and ended up making - to my mind - a far more appealing phone than the Nexus 5X. These samples are just scratching the surface, of course. I'm taking and looking at tons of different types of shots with the new Nexii -- including lots of on-the-go shots of my ever-moving little one in all sorts of awkwardly lit real-world environments -- and I'll have a full analysis of how both phones hold up in my upcoming review. I'll also tackle the broader issues of what each phone is actually like to use in day-to-day life, including some crucially important comparisons related to the devices' forms and displays. One other key feature I’d like to mention is Nexus Imprint, which is the fingerprint sensor functionality that app developers can tap into for their apps, and which allows you to wake up and unlock the Nexus 5X with just one touch. The scanner is very reliable and quick – I estimate the time required to unlock the device at about 0.5 seconds – not the fastest around, but still very nice. The Nexus 5X lacks gee-whiz features such as a curved display or 3D touch, but does any of that matter when you've got an above-average camera and great battery life in an affordable package? Starting at $379 unlocked, the 5X costs nearly $300 less than the iPhone 6S and Nexus S6. Presently only Nexus 6 phones can use Google as a provider, so the 5X and 6P could bring the service more mainstream when they launch later this month. Google’s going to find more competitive markets harder to crack, but Fi could become a major force in the mobile industry if it plays its cards right. We’re testing the service now and will let you know how it turns out. What's the difference between Nexus 5X and 6P? From what I’ve seen, the Nexus 5X is a worthy upgrade to its predecessor. Featuring an Full HD display, powerful hexa-core processor, upgraded rear-camera and all the perks of Android Marshmallow, the handset reeks of potential. We’re excited for the return of the Nexus 5 name and the 5X is as good an incarnation as we could have hoped for. It doesn’t pack as premium a design or hardware as its launch partner, but it’s still wholly equipped to deal with the average user’s needs; from gaming, to photography, productivity and more. Nexus 5X: A return to affordable form? The Nexus 5X is a welcome update to the Nexus 5, but it doesn't feel quite as premium in the hand as its forebear. It offers good specs, even if its not the latest and greatest in all areas. Of course there's a lot that we still need to look out - battery life over time, camera performance and so on - but for those waiting for a Nexus 5 replacement, you now have it. This year we get double the Nexus phone action - the 5.2" Nexus 5X and the 5.7" Nexus 6P, brought by LG and Huawei respectively. They come to replace the two-year old Nexus 5 and the fresher Nexus 6. There's a new Android tablet too, but it's not a Nexus! Both Nexus phones solidify Google's ideal for an Android phone even if they don't break new ground. They share an adopted security focus with a fingerprint sensor for Android Pay and Google Play purchase notifications. Also both agree that USB Type-C is the way forward. If you're looking for a relatively affordable, unlocked smartphone, with 5"+ screen and Google's latest mobile OS, the Nexus 5X is a great option. It's rare that we're able to offer such steadfast and straightforward buying advice, but this handset truly does tick all of the right boxes in our opinion. LG Nexus 5X – Schwächelt das neue Nexus-Smartphone? Positive: Excellent display; decent cameras. Negative: Weak hardware; mediocre design; inflexible fingerprint sensor; relatively high price. 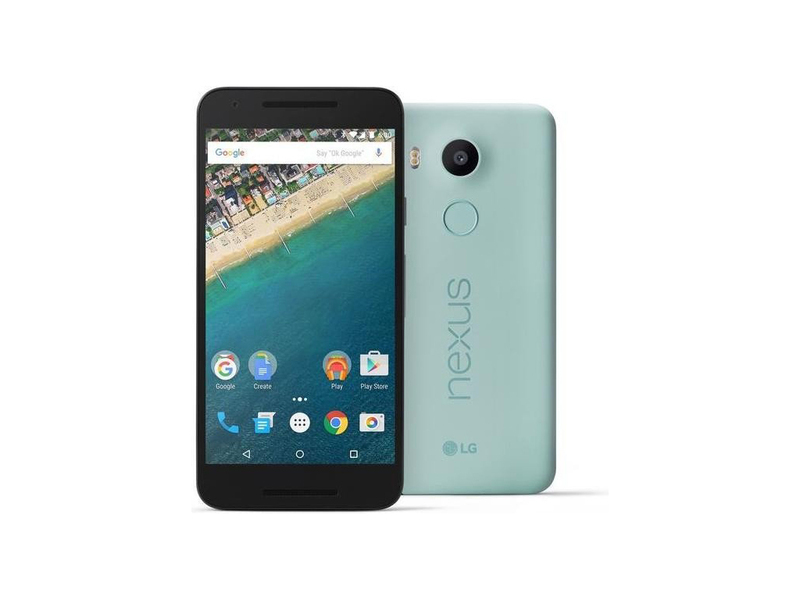 Model: Being one of the first with Google's latest Android 6.0 Marshmallow operating system, the Nexus 5X is Google's answer to users' need for a smaller, compact smartphone device that does not lack in performance. 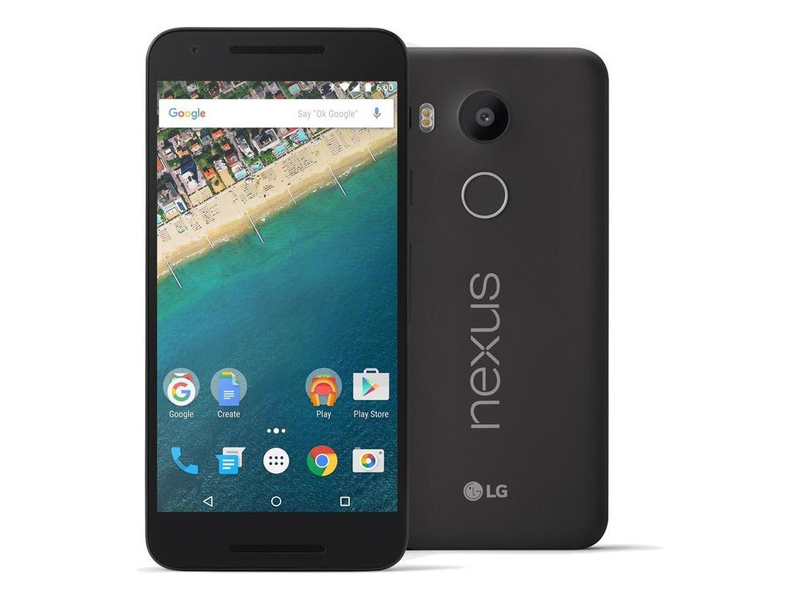 The Nexus 5X resembles the Nexus 5 from 2013 and is also manufactured by LG. It brings the necessary upgrades, which were lacking in its Nexus 5 predecdessor. One of the obvious improvements are the 12.3 MP rear camera and 5 MP front camera. Although it may not be the best camera deal available, it provides fast focus and detailed captures, which fairs very close to what Samsung's Galaxy S6 offers. The fingerprint sensor that comes with this model is also strategically located below the rear camera, allowing a more comfortable and natural hand position to unlock the phone. In addition for a Google Android device, users of Nexus 5 will have the privilege to enjoy the fastest and newest updates for the Android system. However, the Nexus 5 has its fair share of downsides, particularly its less-than-spectacular battery life of just up to a day and its plastic build, which feels cheap and is not justifiable by its price point. Other features of this 5.2 inch, 136 g lightweight model are its Qualcomm Snapdragon 808 hexa core processor, 2 GB of RAM, and a fast-charging USB Type-C port. 83.16%: This rating should be considered to be average. This is because the proportion of notebooks which have a higher rating is approximately equal to the proportion which have a lower rating.